Do you work for SpyBot? "A great secure and powerful tool, if you never tried, you should then"
Well, Spybot is very powerful and i'm using it with windows defender, I like it because gives me a good internet security, it is free, it doesn't get laggy, has a very clean interface, allows me to repair registry files, removes lots of unwanted spywares and it's always up to date. I'm solving my computer's security with Spybot, i'm using this software for a long time and everytime a suspicious file enters my computer, Spybot is there to save me again, extending my computer's life as well.Another benefit is that Spybot is really light so you don't have to be worried about how much it's consuming your hard disk space. Recommending to friends and family to use Spybot holds much more weight when they see that this popular security software is free for personal use. The lack of antivirus for the personal use Spybot version can seem a bit unwelcome, but bundling Windows Defender along with Spybot tends to make up for this. In recommending Spybot to potential users, I would note that the free personal version typically covers everything that you would need an a personal antimalware solution. Bundle this with a good antivirus program, and Spybot tends to do much of the heavy lifting. Moving on towards the professional version, it's a one stop shop for anything and everything you may need an an antivirus and/or antimalware solution. Moreso, the expert and advanced settings are very powerful tools in managing a secure IT environment. We are currently solving our business problems of basic antimalware and antivirus coverage using Spybot. Spybot Search and Destroy has been an effective malware removal tool for many years. The deep scanning removes infections effectively. Spybot uses significant resources and can freeze up your system. The program can be difficult for light and intermediate users as the menus can be tough to navigate. 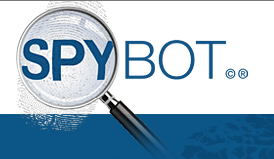 Spybot is not the easiest product to use but it is very effective. I would not use this ona low end computer. Running it in safe mode has been the most effective. We maintain hundreds of users and most devices belong to them. We have used Spybot to remove malware for many years. As an IT professional I appreciate the tools they provide.
" It is essential in our computer." can be downloaded for free in its free version, and its main task is to detect and remove corrupt files, suspicious or spyware robots, which can be harmful to our computer. The design of this program is really simple, with practically four buttons, to do everything, but still, it has many options. What most attracts the attention of the program, at least to me, is the possibility of configuring it in several languages. They should add other skins. and it has a relatively high Ram Consumption. I recommend it because it is free and has a simple interface with intuitive options, it is effective, it removes malware, and it is always updated. protection in the work stations in combination with other antivirus makes me feel more protective against computer intrusions and malicious advertising. The ease of use and ability to uses on different platforms without major installation configurations. I sometimes need something to take a bite out of all the critters that are biting at my heals all day. I don't have time to have a company wide dispersed software to help me fight these issues, so this as well as companies that offer help like this are a great benefit to my day. At times it seems as if it doesn't catch all the issues that I am having trouble with. I have been able to minimize malware attacks and on some of the systems been able to monitor the system to prevent attacks. I work at a Helpdesk and take care of over 300 computers. I face a good amount of malware attacks and if I have a software like this, it minimizes my work. "Free all-in-one tool to fight Spyware, Malware and Adware"
It allows to correct problems in the registry of the operating system, in the objects of Active X, and Winsock LSPs as well as the malware and other programs that try to infect the system by means of mails, propaganda in the Web and several Internet pages. With SpyBot you can destroy over a thousand spyware-type infections, including the infamous Gator, Web3000, BDE Projector, Aureate, Cydoor, DSSAgent, SaveNow and webHancer. Plus, and one of the most interesting functions, is the ability to immunize your computer against future infections. The only downside is the lack of updates, but as it's free software, it's logical. Thanks to SpyBot our systems that are always operating on the Internet are more secure and our computers are free of network threats. Since we installed it we have not had any problems as we did before, so it is a very safe product. "SpyBot Search & Destroy is one more tool for fighting in defense of our own privacy"
I've been using this program for years and fulfilling what it promises. It has a very comprehensive database that helps to be protected. On those who comment on the language, I downloaded it today on a new computer, but the installer does not give to choose Spanish, when installed appears the entire program in Spanish, at least to me that's what happened to me. It's in English, but it'll save your skin. It's his only drawback. That's why I don't put a 10 on it. He resurrected my computer. This program is excellent. He resurrected my computer. My computer had been running very slowly for some time. Each program took more than half an hour to open (including browsers and Mail). I tried to fix it with a program that has very good press: the "Malwarebytes ". Well, I do not know if it was because of him or not, but the fact is that when I tried to clean with this program, the computer was almost dead. "Un outil simple mais efficace contre les infections." Coupler à un antivirus car non intégrer à spybot en version gratuite , on a un arsenal simple pour la protection d'un ordinateur. La version gratuite est donc plus que suffisante pour un usage personnel, il va nettoyer efficacement contre les malwares et les spywares. La version payante offre l'antivirus intégré mais aussi des outils puissants qui peuvent s'avérer utile notamment la création d'un cd de boot pour éliminer les infections directement sans passer par le système d'exploitation. Il n'y a pas d'antivirus intégrer c'est juste un simple antimalware mais qui fera le plus gros travail en cas d'infection ou alors il faut passer à la version payante du logiciel ce qui peut être problématique dans certains cas. Pour se débarrasser des déchets du web c'est un super outil spyware malware il fait du bon nettoyage. Il a permit de faire un nettoyage du système infecté de tout ce qui concerne les malwares les spywares et tout cela avec seulement la version gratuite. Le nettoyage a été efficace avec ce simple logiciel il n'y a peu besoin d'investir beaucoup plus que cette version gratuite. "A good spyware program! " The program updates and spyware databases are always updated and current! It picks up some spyware others don't. Nothing against Spybot, but I literally use three different spyware programs to keep me covered. All of them seem to pick up some things and not others. This is the case with Spybot as well. This is part of a spyware scan I run every so often with other products as well that is separate from my virus checker. I do not enable it to run all the time, but instead manually run it in addition to other spyware programs. Helps detect and remove spyware. Helps keeps my browsers free of annoying spyware pop-ups and unnecessary background processes from running. "Spybot is a good solution when you are stuck with a pesky virus"
I like that the Search and Destroy product has become a formal A/V solution. It allows for a thorough scan and removal of virus' and malware. The UI is easy to use and installation is simply and quick. Removal is just as easy if you do not want it to conflict with another A/V or A/M solution. I wish the free version offered a little more functionality. I use the free version if I am stuck in a pickle. It compliments my other A/V and A/M solutions quite well. Spybot is a great A/V and A/M solution. I may even considering it for a full implementation in our environment if they can work with our endpoint solution provider. Today I just use the free version and I am satisfied. "Spybot - more than just a malware search and destroy utility"
Spybot Search & Destroy has been available for a number of years and the feature set has expanded along with its tenure. Being able to automate the functionality of the program in the paid version is a big plus over the free version. I especially like the "immunization" feature of Spybot which updates your hosts file with names of websites which have been known to house malware. If you add your own sites to this file and Spybot updates the hosts file, your additions are not removed or edited. I would like to see the free version have the ability to be automated from within the application. 2. Helping to prevent access to inappropriate sites even when users are not connected to the corporate domain. "Several years ago was a revolution and today is on the same level"
Immunization was always a selling point of this software and today is protection against some 250 000 types of malicious software.. There are diferent "moduls" for diferent browsers, in x86 an x64 modes. This is a must use for everone that had a misfortune to had a hijacked browser. 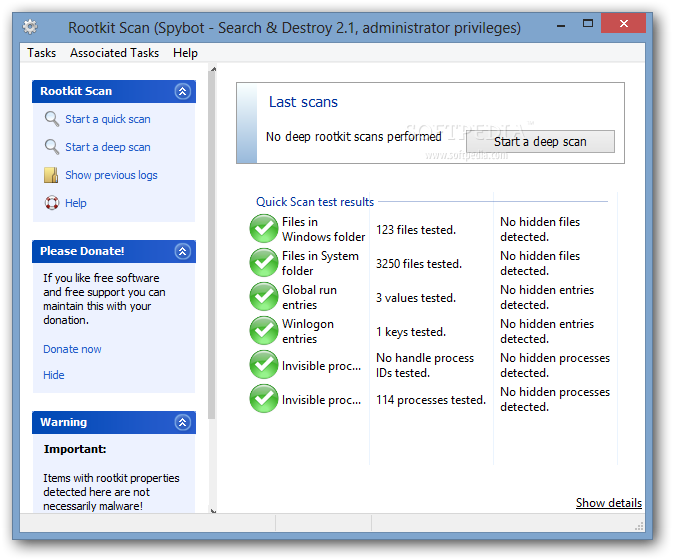 Also, "Rootkit scan" is a necessity today, for any standard anti-malware/anti-virus software. S&D have 2 levels, fast and deep-scan, both doing a great job. Speed of updating is, after all this years, still a problem. With all today optics networks and high-speed internet it's incredible that some updates can take 10+ minutes to load. Also, 1st instalation can be a tricky one. 1st Immunization can be also time - consuming (but it's the best feature of this software). Simple but revolutionary software that is a pleasure to work with. After instalation 1st thing to do is to immunize a PC, only after that You can go with all other interesting options. Security in work, blocking diferent types of malware, internet security in general. I have use this software for many years. I recommend this software to all my friends and l highly trust this software on its ability to protect and clean an OS. over the years that i have used this, i always like the ability to clean and remove what i want in the registry. Its easy to understand and with detail descriptions, it makes it clear to remove what is harmful. This software has browser protection and detection. It also scans for intrusions or potential problems within software that could be making your computer at risk. In the end this software is free and is always having updates on the latest spyware and malware updates. There is not much to dislike. over the years there has been many advancements and has gotten faster in its scanning. i would like to see it a little more faster but you can't complain when its free and it works. would like this software to be available in mac. I recommend to keep up to date with updates and releases. Also have more than one software detection. In my experience, i have use this software and it works best to remove any intrusions in safe mode. but everyone has their own method, however this has always worked for me. we have encountered where one malware didn't get detected but another picked it up right away. its best to have multiple detections but with updates and future advancements in software, i hope it detects what others have detected. we are encountering very rare situations where we get one for mac and this software is not available for it. "Using Spybot in my enterprise level environment"
The simplicities of Spybot are the main draw. With minimal user input I am able to monitor over 150 workstations with plans to expand it further. Updates are seemless, though there have been a few instances where one or two adware breaches have occurred. Most due to user interference. I wish updates would occur more frequently to the database of known malicious software. That is really my only complaint. It finds more malware than others AND prevents malware better than others by immunizing your browser from thousands of threats. They don’t have a Mac version. That’s the only thing I don’t like. I fix people’s computers all the time with SpyBot. It helps keep people that are not tech savvy from destroying their computers, which in turn helps keep me from spending a ton of time on fixing problems. What I love most about this product is the effectiveness of this and how accurate it. Not only does it search throughout the basic folders on your computer its actually goes deep into deal on the computer and finds all the hidden bugs, and then notifies you about its find!!!! It can be time consuming but that only means its doing its job. Which is good but I recommend doing this at night or at the end of a business day if using at work so it has time to do a good run through the pc without interrupting your work! Best Anti Virus so for that I have used! I have used a lot of different ones that claim to actually get the job done and SPYBOT has out done themselves! I find that my computer not only run faster but better especially after a good detail run! When my computer is running better it makes for a better work day too!!! "Immunize is the best feature not found in other products"
The immunize function. Creates 127.0.0.1 loopbacka of lnown root kits and spuware. Ver 2.6 is not tech friendly. Ver 1.6 has more features unlocked but is the beat product neat to Malware Bytes. The resident shield needs to be disabled on install Tea Timer, it prompts for everything. One of the leaders in not just resolution but in prevention. Problems, sometimes doesn’t find what we needed to remove. Benifets the immunize with boot time update and immunize if updated is fantastic. This product is able to scan for the less dangerous but often annoying bits of spyware and malware that slip through most antivirus programs and eliminate them. By removing these annoying bits of malware, it's able to improve the performance and health of your PC. The program tends to hang a lot and a full deep scan does take a long time, although it's worth it for PC health. This program is not necessary but highly advised as a second line of defence for your personal and/or business files. It also plays well with any antivirus program. SpyBot will save time and money by extending the life of a PC. It can also prevent any malicious programs from stealing your data as a second line of defence to a regular antivirus program. It looks like it is doing something, it does pop up every now and then, but it is totally unclear what it is it finds and whether it is malicious or if it is a legit software application that is needing to perform that action. Not user friendly, it doesn't tell me exactly what software is trying to change my registry so I am never sure whether I should block or allow. The terminology it uses doesn't even make it clear to me whether I should click 'OK' to either block it or not. And I am not a dummy, I am a software/ web developer myself and I specialize in usability. I also had malware and it could help me get rid of that. I am not really happy with it, try looking for something better is my advice. "Gran herramienta para detectar software espía "
Lo que más me gusta de Spybot es su facilidad de configuración, actualizaciones de las definiciones gratis y que es gratuito. Lo que menos me gusta de Spybot es su gran consumo de recursos. No es recomendado para computadores con pocos recursos. Recomiendo usar Spybot a aquellas personas que necesiten protección rápida y fácil de utilizar. "Very thorough, fast and up to date utility"
Spybot updates the virus list very frequently. Sometimes misses malware. It wants to install Tea Timer which I don't want installed. It is easy enough to uncheck but if you don't pay attention it installs it. Clean our PCs and rid them of unnecessary files, add-ons, registry entries, remove programs, and find viruses that slip by our anti-virus software. It’s very customizable... you can do deep scans, just check your registry integrity, even tweak your startup items from one easy to use console. "Free Edition of SpyBot is a lifesaver"
live scanning isn't available with the free edition but can't really complain because its free. The free edition has saved me many times, especially when normal AV cannot detect the malware - It's free so you cant go wrong! "Great Program to Clear Viruses and Spyware"
The ease of use in updates and running the program. I did have some issues of latency in my computer during startup, but was able to fix it. Utilize this for daily, weekly, or monthly searches to improve the safety of your computers from viruses and malware you didn't even know existed. SpyBot has always proved to be an effective and helpful cleanup tool. Regular updates and easy to use. That various Antivirus applications will register and require to be remove during installation. End users with web browsing will leave behind various trails that SpyBot will cleanup nicely. "Spy bot... analiza y destruye"
I like that its easy to use and also does usually find whats is hiding on the PC. It does spot quite a bit right off the bat with out having to run anything. it's a very thorough spyware cleaning tool for removing malware. it takes very long to run a full cleaning pass. definitely try it. it is worth it. removing spyware and preventing malicious software from getting on our computers. "Still the best for ease of use"
Spybot is quicker and easier to get up and running than other spyware cleaners. Its scan is thorough and finds objects others don't. Cleaning what's found is button-click simple. Try it. It's free, it's quick to install, and it works! For bad infections I always run multiple scans, and spybot is one of my 3 main scanners. Scan time is a little longer than others, but many times it finds things the others don't. Keeping computers malware free and preventing further infection. "Malware detection for Windows - The tool needs improvement"
We used spybot for malware detection on windows system, it has a free version which does the job to some extent. Spybot catches about 1 in 5 malwares and is not very efficient. "Good but noticeably slower than rival programs"
Easy to use, with a choice of interface options. Searched my PC for malware with the click of a button. If it finds suspicious software on my PC, it can get rid of the parts that are responsible for the advertising and surveillance without impairing the functionality of the actual program. Immunization and quarantine functions are available for additional security. Sometimes they are a bit slow updating the database. spy bot is simple, to dwl, install, and use. its been one of 3 main products i use to clean up after an infection..
what are you trying ot solve? does this meet need? repairs a lot of wholes identifies issues and helps us get users back to work. "Amazing software, just got surpassed "
It was one of the best and first free spyware protection programs. They pretty much got left in the dust in comparison to Malwarebytes and all their acquisitions. Don't rely on it as your only but definitely a capable spyware scanner. Spyware solutions, occasionally will run just to add another peace of mind layer of assurance. "Free personal version is great!" This product doesn't compare to the larger anti-virus and anti-malware/spyware options out there. If you work at a large corporation with a dedicated IT department, chances are you'll end up using one of those and not needing SpyBot. Although it has paid offerings, I've only considered it for personal or SMB use in the past. You'll probably want to look at a few options. I've use this for my personal computer, and it even has a browser plug-in. However, if you want to use this at work, good luck getting it past the admin wall! It's also a bit slower than other vendors. "Speed up your system on a budget? You betcha!" This is a lifesaver of a product, it has cleaned up and detected so many things over the years that i have donated to the site several times over. This product succeeds where most if not all antivirus fails in detecting why a virus keeps popping up. I dislike 2.0 but love 1.62 a lot. I am lost in the new product, the older one was much better laid out. The other dislike is that it sometimes gets clobbered by antivirus programs (yes McAfee I am looking at you). Bring back the classic layout of 1.62 it was a dynamite solution. Detect spyware and kill it with a vengeance. This product does exactly that. "Very good at finding things on your computer that don't belong"
Spybot has a very user friendly interface and it relatively successful in removing unwanted spyware. While no program is 100% effective, sometimes this one will miss a few things and you may need to run a scan with another tool as well. The product has a variety of features for both the basic and advanced users. Some of the features are not easy to get to if you don’t know what your looking for. "Spybot works as well as other spyware removal tools." Spybot Search and Destroy is free and does an acceptable job removing spyware from your computer. As with many programs, you must pay to get the advantage of all options. "Spybot, the anti-malware ive been using for years"
Spybot manages to clean up most if not all malware infections and prevents against future infections when installed. The visual experience could use a little more updating. Mostly malware and trojen pritection. "Holy smokes this app is awesome!" Price is free for personal use! Can be setup to monitor your pc at all times. Very in-depth scan for malicious software/cookies/trojans etc on your computer. Can run pre-windows to catch items in memory and get rid of them. I love this app! I've been using it for about 10 years now. Nothing, this app is awesome! If you have a "bug" on your pc and are having trouble removing it, this app will help you out. I've helped several family members and friends get their pc's back to normal by installing and running this.